Welcome to a brand new week friends! This weekend could not have flown by any faster… whew! Sometimes I wish I could just add about 10 extra hours to my day- don’t you? But, I worked on some seriously fun projects this weekend and I cannot wait to share them with y’all! First up though, let’s chat transitional style! 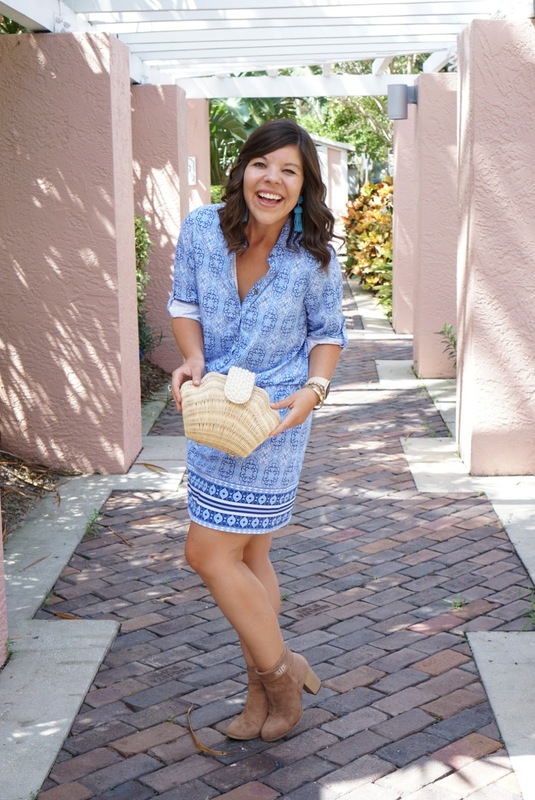 I’m not going to spend the season droning on and on about how Florida is still SO HOT… but I am going to show you how I dress for it! Last year I finally got into the look of booties, and now this year it was the thing I was most excited to pull out of my closet for fall! But y’all, today’s booties are not just your average pair… they are monogrammed!! I mean seriously, could they be any cuter?! What makes them even better is the monogrammed piece snaps on, and the boots come with two other attachments, so if you want to switch them out you have the freedom to. 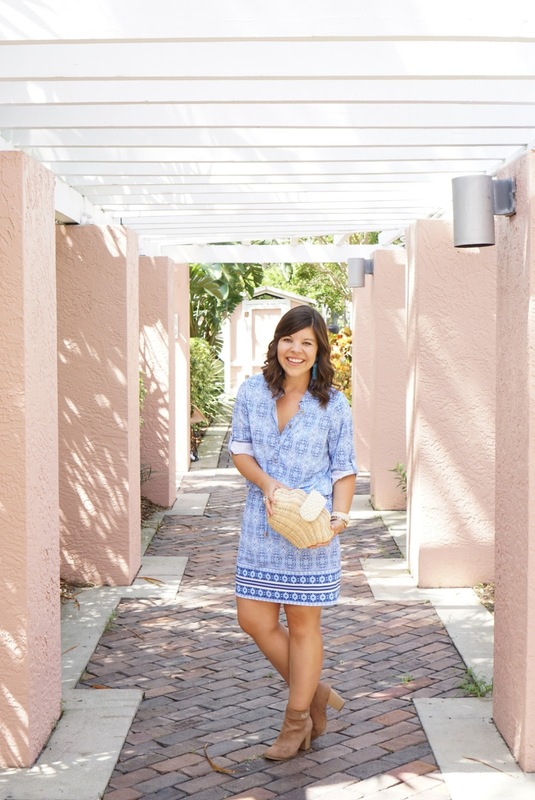 As long as the sun is still shining, I keep on loving my Cabana Life dresses! Even though this dress has sleeves, it’s made of the best material that doesn’t make you sweat at all! And every piece of clothing has a built in SPF50- so you’re always protected! Finally, I have to mention my newest swoon-worthy tassel earrings! I can’t believe it took me so long to try out statement earrings- they seriously make every outfit so much fun! So, as long as the sun keeps shining I plan to keep wearing my foolproof dress + booties combo to get me in the fall spirit! What are you doing to welcome the new season? A special thanks to So Sarah Hunt for taking these photos! Previous Post 11 Things I’m Excited About for Fall! I died when I saw that your boots were monogrammed! They are adorable! 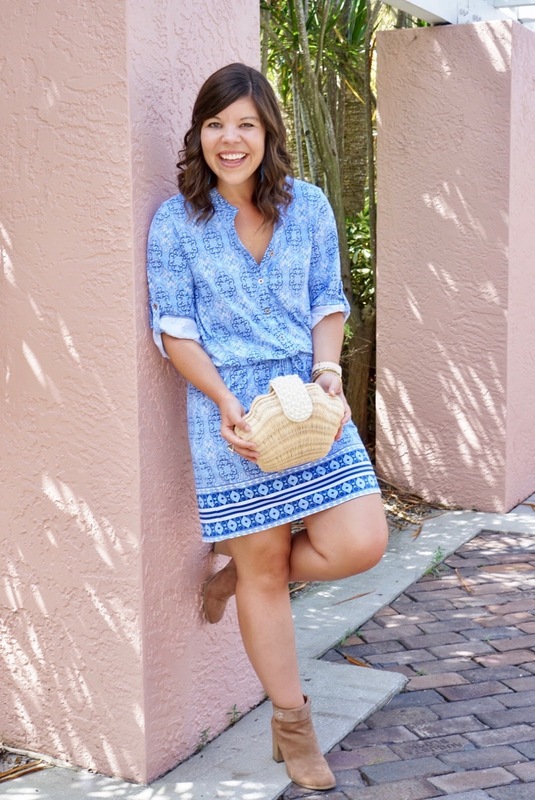 This is such a great transitional outfit! That bag and those booties are the cuties!! This is such a pretty setting! 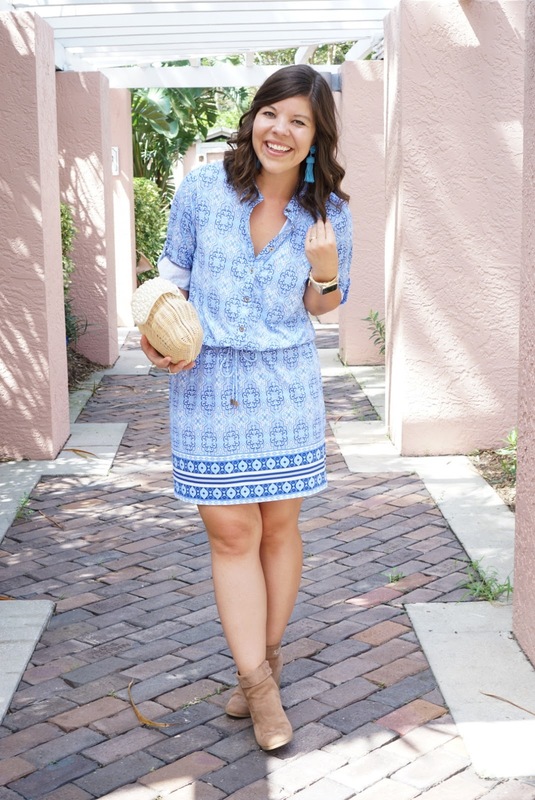 Love this dress to transition into fall – hope things cool off for you guys soon! I love the bright dress paired with the booties! Marley Lilly is the best, and, of course, I love the monograms! You look amazing! Those boots look JUST like you! 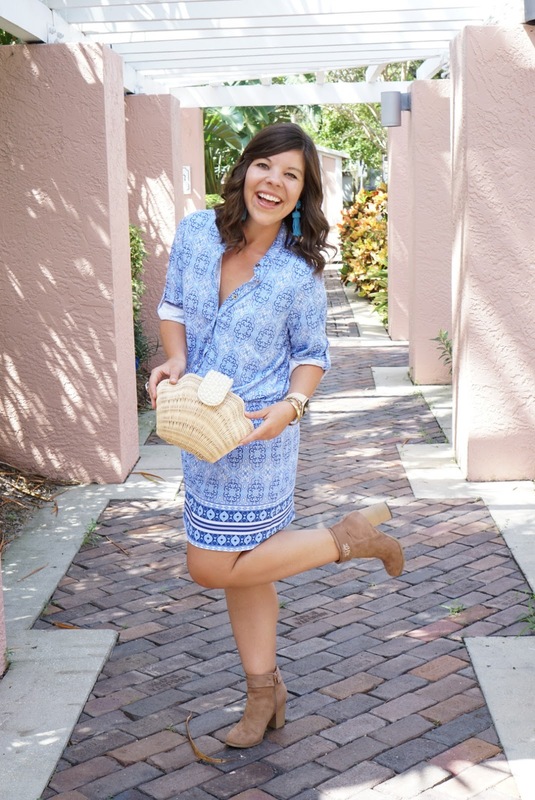 Adding boots to a cute dress like this is perfect for the transitional time. 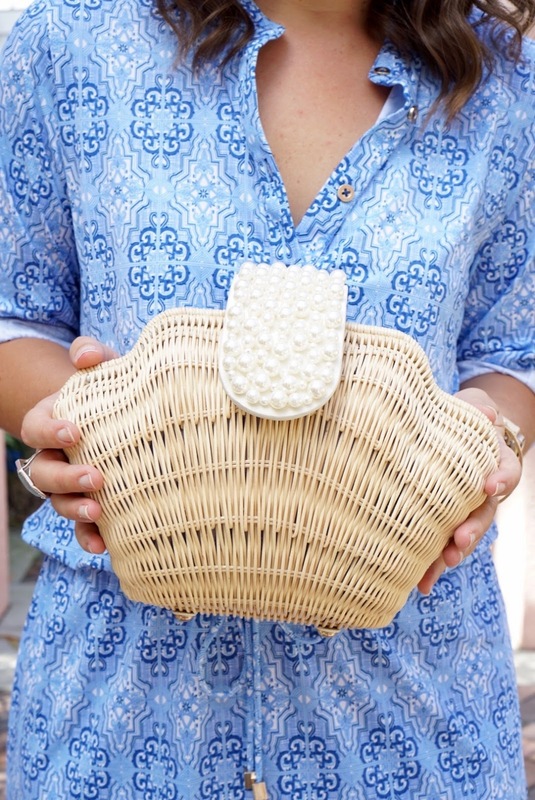 How fun is the monogram and your cute bag?! 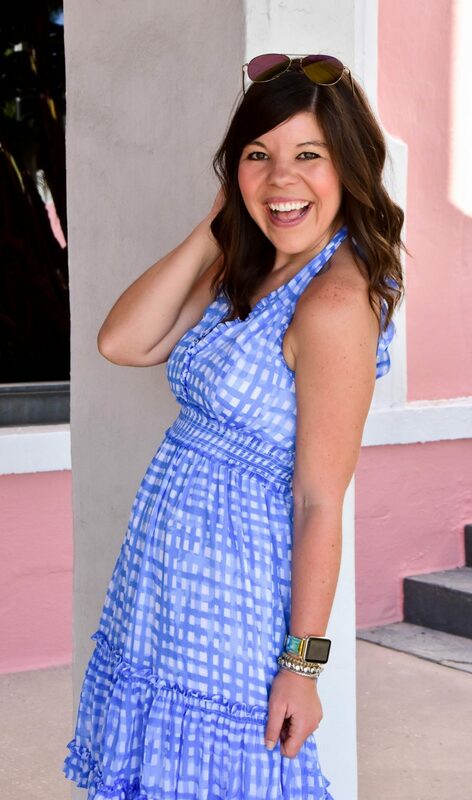 Love the colro and print of your dress! Also, that's one adorable bag you got there babe.